Countr, a NYC-based company, aims at streamlining the whole online shopping process and making it more personal. It is a personalised shopping app on which users can shop with their friends, receive trusted recommendations, showcase their style, and earn money for their taste, all in one place. They’re calling it shopping with your style tribe. 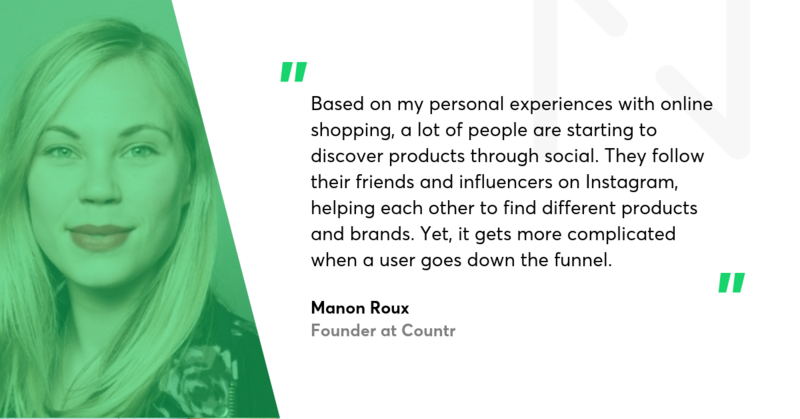 Manon Roux, Countr’s founder, came up with the idea for the application through her own frustrations as a shopper. She has come a long way to shape the product as it is today – with a beautiful feed, a Machine Learning-based discovery algorithm, and over 160 retailers in the network. I spoke with Manon about their journey. What is the idea behind Countr? Simply put, Countr is your style tribe where you can shop together, find inspiration, give recommendations, and earn through your content. Product discovery is a crucial element of Countr. How does it work? When a user signs up to Countr, they need to select stores that they want to get recommendations from and categories they’re interested in. Users can shop from an array of categories: from fashion, beauty, and lifestyle which is anything from kids, to travel, to sports. They can also select specific categories (e.g. workwear or skincare products). Their feed will show them products from the category buckets they specified during onboarding. Let's say they picked workwear. Using machine learning we determine the optimal ratio of surfacing up preferred retailers versus other new retailers that users may like. This discovery ratio lets users shop their trusted brands and discover new, relevant brands based on their individual preferences. A really important feature for creating an optimal shopping experience. Does the algorithm also learn from user actions, such as things they like, users they follow, and products they shop? That's the ultimate goal. The next step in the machine learning process is to take information about user behavior (liking, disliking products, buying items etc) and determine what they want to see. There's multiple layers that come into place in defining why somebody likes or dislikes something. It might be the color, or the price, or that they don't like the brand, or the style. We will learn that over time by collecting more data to better define what a consumer wants to see. I bet it hasn’t been easy to develop the recommendation system? We have spent the last few months honing in on the personalised feed. We did a lot of user testing at the beginning of the year to figure out how to help users discover tailored recommendations in an easy and consolidated way. Machine learning helps us provide this optimal shopping experience. Was your application inspired by any other apps? We've replicated bits and pieces of different platforms, whether it's the one-stop shop aspect or that of having a chat system. There are platforms which enable influencers to work with their affiliate programs and tag certain products. There are similarities in many aspects. However, with Countr, users can discover and shop items in one place. If there are five products from five different stores that are listed on an image, the consumer can buy them without leaving the app. On any other platform, you would have to open five different tabs. We make shopping more fun by only showing users things they’ll love. We make it more personal by building a community of trusted shoppers who give personal recommendations (no ads or sponsored content), and enjoy sharing with their style tribe. We make it faster by giving them access to hundreds of stores in one place, with single-cart checkout. We also make it playful by allowing users to cheer and tip each other for sharing their great content (product finds, style tips and shoppable posts). Sharing within the community is a natural behavior, and we invented a fun and easy way to get paid for your taste. What is the business model for the application? How do you plan to profit from it? We take a cut on product sales and in-app purchases for our coins system. What is the plan for attracting new users to sign up for the platform? We’re currently recruiting ambassadors on campuses to help build awareness. Students are encouraged to create posts on Countr together around a certain theme and to promote their shoppable content on Instagram, inviting their friends to follow them on Countr. We’re reaching out to both micro and larger celebrity influencers within different niches to come on as brand ambassadors. Bigger influencers will be able to lock certain parts of their content and users will have to pay coins to access them. Launching the app! 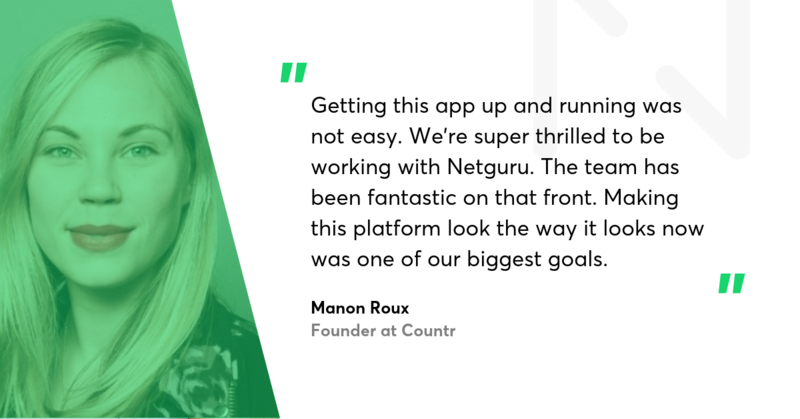 We're thrilled to be working with Netguru. We wanted to create a clean and easy app to shop in, and the feedback has been phenomenal so far. I think we’ve accomplished that. Our main goal for the year is to build traction and scale our user base.